Beautiful Birthday Wish for Roger Landry and TLB – Celebrate both August 19th! 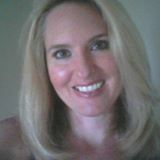 The following heartfelt message was submitted by Dawn Egelseer, a completely devoted supporter of The Liberty Beacon project since its inception two years ago. That day also happened to be Roger Landry’s birthday, the founder of TLB. So, on Tuesday, August 19th, we will be celebrating both events – the launching of The Liberty Beacon project and Roger’s 60th birthday! Personally, in my search for liberty-minded groups, I have found many and most truly are sincere and devoted to freedom in this country. I am still connected to some, one way or another. But there is something very special about The Liberty Beacon project which I noticed and felt very quickly after beginning my journey several months ago as a writer, editor and executive, working very closely with Roger. I have hardly met anyone who works so tirelessly and passionately to help right the wrongs in this country and the world. And with so much compassion, knowledge, honesty and understanding. And always willing to praise others in their efforts to do the same. The Liberty Beacon project is well worth supporting and contributing to in any way you can. We have some talented, devoted staff and we always need more to help forward truth and education, our mission. Have a great Birthday week, Roger and always! 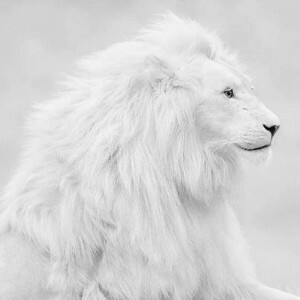 If anyone truly represents the “White Lion” it is you, you are all the lion represents and more! The word courage comes from the Latin “cor” which literally means heart. The original use of the word courage means to stand by one’s core and conscience. This is a striking concept that reinforces the belief found in almost all traditions that living from the Center is what enables us to face whatever life has to offer. To encourage means to impart strength and confidence, to inspire and hearten. So, the question unfolds: How do we encourage ourselves, each other, and the world? And just what does it mean to live a life of encouragement? If to find our way to our core is to face the lion, then to stand by our core is to be the lion. And to sustain the practice of living from our core, to live out of our courage is to find our way in the world by tracking inner courage and where it lives. The courage we all admire, where ordinary people summon unexpected strength to run into burning buildings or to stand up to tyrants, or an abusive leader, this inspiring and mysterious impulse to rise to a dangerous situation, which Hemingway referred to as grace under pressure, grows from another kind of courage—inner courage. By inner courage, I mean the ground of quiet braveries from which the more visible braveries sprout. These are the ways of living and being that make bravery possible in the first place, not just as an event, but as an approach to life, as a way of life. It is a devotion to exploring those quiet braveries, in an effort to understand not only what constitutes courage in its deepest sense, but in knowing what is the soil in which it is seeded, watered, cared for, and grown. Thinking about courage in this way opens us to an array of small and constant efforts that no one ever sees, but which have changed the world: the courage to face ourselves, each other, and the unknown, the courage to see, to feel, to accept, to heal, to be. Efforts of this nature often go unnoticed and unrecognized. Like the courage to break life-draining patterns and let the story of our lives unfold, to stand by one’s core, and to persevere through the doorway of nothing into the realm of everything. Like the courage to choose aliveness over woundedness, to remember what matters when we forget, and to build on the past instead of hiding in it. Like the courage to choose compassion over judgment and love over fear, to withstand the tension of opposites, and to give up what no longer works in order to stay close to what is sacred. These subtle yet essential states, and more, make up the elements of living, and so, it serves us well to explore how they grow singly and together. 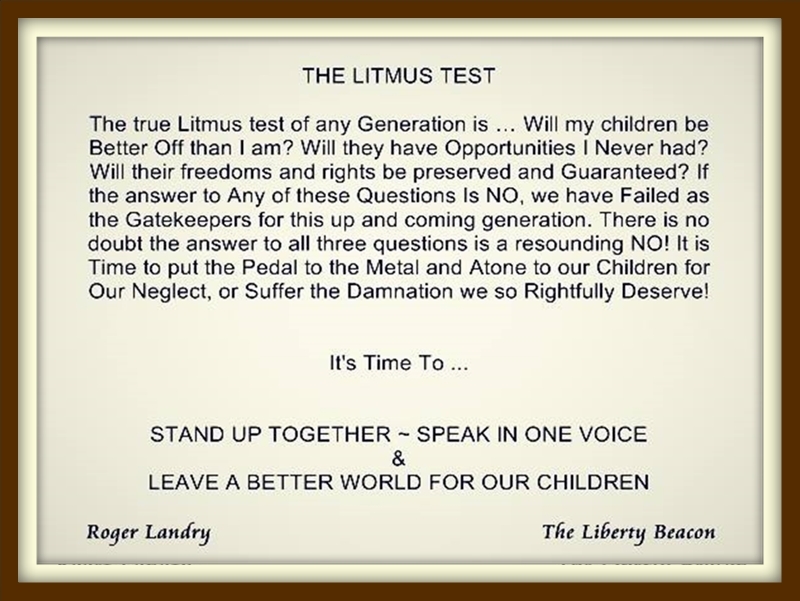 The Liberty Beacon project is an education I never had in school, but which life has been shouting for as long as I can remember. This is an education of what matters. I have come to believe that we can only learn about and discover the capacity and meaning of our courage in the context of our struggles, in how we face and inhabit the challenges life presents to us. In this, courage is an applied art of spirit. It is not something we can manipulate, but only live into. Recovering the Source and living it out in the world, alone and together, is a lifelong devotion. One that we must, ultimately, inhabit alone, but one which we must enliven together. It all starts with “you”. 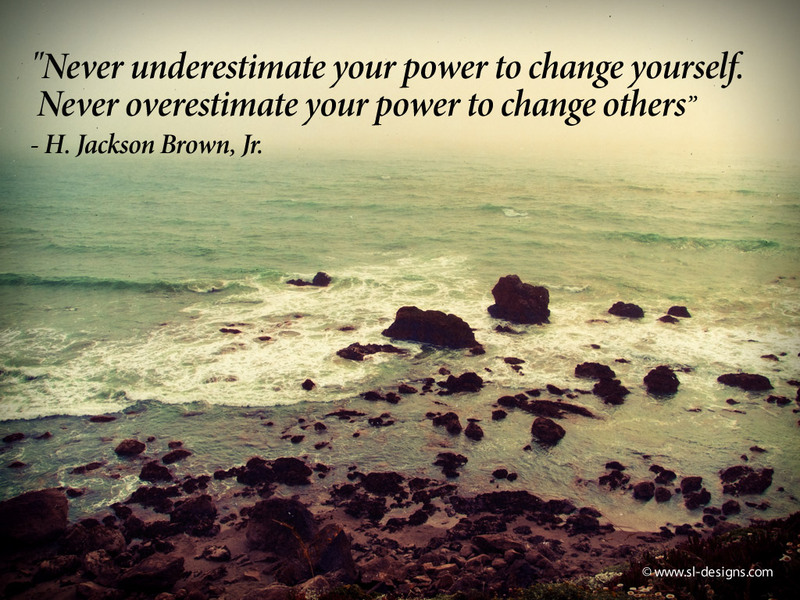 We cannot change others but we can change (or grow) to become the person we want to see in the world… and if all of us where just like you with your knowledge, strength, courage and strong spirit we could and will make that happen! I wish you many birthday blessings today and always! I am so very proud to present a show long in the making. This show will bring together for the first time, two proud and concerned American authors, Bill Muckler and Duke Lakeland, who felt the need to speak up on a grand scale. The result is two great books well worth the time to read! What are the problems facing We The People today? What are the solution for these problems? What we present here is the chronicled feelings, hopes and expectations of two highly intelligent and well researched individuals. For me (the founder of TLB), it can’t get much better than this. Both of these books are brilliantly written and massively researched. But most of all they are written by two individuals who have lived and seen the change in America, a country that has fallen from the castle on the hill … Camelot, to a country on the verge of economic and moral collapse, and all within their lifetimes. This does not have to be, and they each, in their own ‘complimentary’ ways, will blatantly tell you how and why. You have all heard from each of them individually (Past TLB Specials) in the recent past but combined the three of us bring over two hundred years of observation and reality to this discussion. 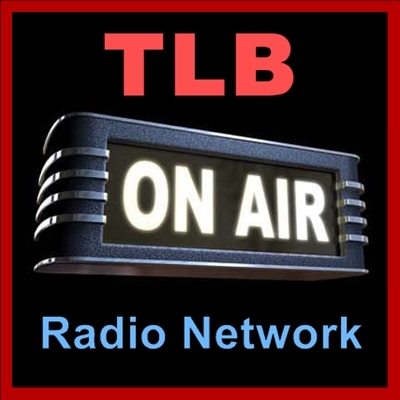 Please read the intro we provided for Bill and Duke and listen to the show “America In Crisis – How Can We Save America?” at the bottom of this article (click on the TLB Radio Network Logo). Veteran, Visionary, Entrepreneur, Problem Solver. I’ll never forget a sunny Saturday morning in June 1958 when a group of tanned, chiseled candidates stood to take the oath of an Officer in the United States Marine Corps. I still remember solemnly swearing with pride to support and defend the Constitution of the United States of America. That oath was taken with joy in a nation filled with an enthusiastic spirit, full of energy and excitement over the bountiful prospects that lie ahead. Living by that oath is my way of life. My vision of America has not changed since that day of great magnitude so many years ago. However, something terrible has happened over these many years. Our country, so poised to accomplish monumental undertakings has gradually become a listless, a lost ship in a roiling sea of uncertainty searching for a beacon of light. We have lost our direction and our moral compass. I yearn for the days of promising career opportunities for everyone and the news of countless discoveries in science and space. My vision still burns bright. Competent, creative leadership can regenerate that same spirit and joy of accomplishment. We can find our way. Lets all roll out the revolution to reinstate our Constitution and to regain the essence of generations passed. “20/20: A Clear Vision for America” has become my life and my life is this vision to make America whole; to keep Americans safe; and to straighten the dysfunctional federal government path of corruption and apathy. I quickly learned to be a leader of Marines, I had to recognize that each Marine not only has value and is equally important, but every Marine must add equal value no matter their rank, role or assignment. We could only accomplish our mission when we all worked together. We all relied on each other. We all had trust in each other. We all had to respect each other. It became clear that these are the essential requirements of all successful organizations. My vision applies this same principle to our republic. Every American must add value. We must all respect, trust and rely on each other. All must have a meaningful education, substantive career training, satisfying jobs and a superior standard of living. My vision creates the solutions to achieve these goals; this mutual sense of purpose where everyone experiences the joy of achievement and pride in self-reliance. I envision a mighty golden chain with more than 300 million links stretching from sea to shining sea. Each link represents an American citizen. Some links are strong and shiny; some are weak and tarnished. Some need extensive repair. To be a robust republic, we must meet the challenge of strengthening and polishing all 300 plus million links in our country’s chain. Our Constitution is like a well-designed software program. It works well, and we must keep it intact. But our computer has become over taxed and over regulated with cookies and other junk. We need to clean up the corrupted federal government files and reboot. The 20/20 Vision demonstrates that the only way to improve government is to reduce government. It proves that the illusion of more laws, more taxes and more regulations are destroying the spirit of America. 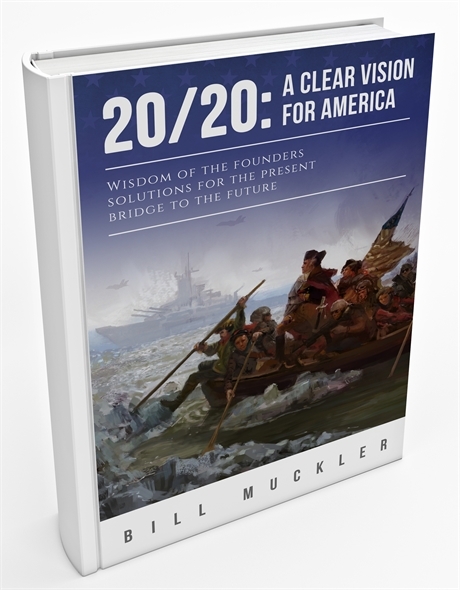 The 20/20 Vision is a book of practical solutions using established business management principles such as cost-benefit analysis to prove that a small, limited government is the true path to economic stability. It tells how to balance the budget and produce a reserve to decrease the national debt. Our economy is crumbling under the weight of failed policies that reward indifference and punish productivity. Politicians have imposed more than 100 excessive taxes on the country over the past 100 years. The result is a faltering economy and millions on unemployment insurance, welfare and food stamps. The book radiates the optimism of take-home pay increased by as much as 40 percent and the joy of higher wages that eliminate poverty. The spirit of the people is rejuvenated by the revival of the space program. An electrified nation is made whole with a common purpose in a period of new exploration. The 20/20 Vision implements an ingenious voluntary tax system that generates sufficient revenue to operate all levels of government. Citizens no longer penalized for investing in their own economy by the immoral capital gains tax have ample retirement funds. Corporate taxes that cost jobs and wages and result in higher prices of goods and services are eliminated. Needless regulations are scaled back 20 years to reduce prices of goods and services. Social Security recipients receive a tax-free 20 percent increase on their monthly benefits plus allowances for Medicare parts A and D instead of deductions. This plan results in more than $4,000.00 of additional annual benefits. Military personnel receive a 20 percent increase in pay and allowances to reward them for their service and raise their much-deserved standard of living. The Veterans Administration is streamlined and accessible. A minimum wage of ten dollars per hour is implemented in conjunction with a four phase jobs training program for all high school graduates from eighteen to twenty-seven years of age. Adult jobs training programs are available for enrollment by all citizens. The borders are locked down while the country restores the legal immigration system. Foreign nationals are given the opportunity to enroll in citizenship queues, work queues or student plans. The 20/20 Plan envisions privatized health care that is affordable to all. An energy independent country. Confidence in Internet freedom. Abolishment of domestic spying. Illicit drugs that are re-legalized and subject to taxation. The parole of non-violent prisoners enrolled in established work programs. The restoration of civility and the rejection of Political Correctness. Term limits are imposed on Congress and the States affirm their rightful jurisdiction and authority. My vision of America is a call to action to create honesty and integrity whereas citizens realize government is the hindrance, not the answer to a bright future for their children. Visit Bill’s website for more information. 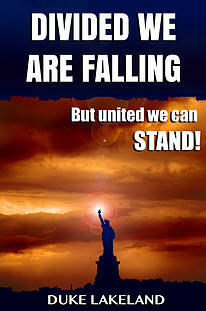 Duke Lakeland – Author of Divided We Are Falling, But United We Can Stand! America needs help! Financial instability, fighting factions, corporate greed, irresponsible Congress, etc. Have you tried to influence politics but failed at it? Maybe you did contact your members of Congress and got no joy – then gave up. Have you at least been able to help things at a local level? We have to get control of the federal government which is spiraling out of control by stopping the things that aren’t working to our benefit and change to things that will benefit us all. First comes understanding – then comes action! There is a group that is sucking the life out of this country that is behind the fighting, the racial strife, the corporations buying up Congress, struggling to make ends meet, an inadequate minimum wage, financial bubbles and bursts, etc. The people in this group appear to have no allegiance to any country and especially none to the common man. However, the other part of the equation has to do with citizen participation. Do you know people who complain about the way things are going but don’t do anything about it? Have you ever done that yourself? There is an old military tactic – DIVIDE AND CONQUER. If an army could splinter up its enemy and get the splinter groups fighting within their own ranks, the splinter groups could be picked off one by one until they were completely conquered. The first task is to find out who is really pulling the strings. If we just fight among ourselves, we won’t make it. We have to expose and cut off the head of the snake. My book exposes the head of the snake – the one group that pushes all the other agendas on us. It doesn’t matter if you are Left or Right, Democrat or Republican, old or young, we all need to work together to get rid of this group from our country because nothing will get fixed until that happens. Every day the federal government runs up debt that our children and grandchildren are going to have to pay. There won’t be enough money to pay this debt, so they will have to pay with their homes, their jobs, their future. They are rapidly becoming slaves to this debt and it’s not fair to them. Those who stand to benefit from this are the group I mentioned above. They are pushing their agenda in the halls of Congress with millions and millions of stolen dollars. With understanding comes hope, with hope comes action. We cannot leave it up to our children and grandchildren to fight the snake alone and unarmed. We all need to work together to fix this now. If we do this, we will be able to create a new civilization that will outshine anything we have ever seen in the history of Earth. Please get and read my book and give me your feedback. (See button to the left.) If you don’t have a Kindle device, go to the instructions page (tab above) and find out how to read it on your computer device. I truly believe that if enough people would read my book and act on it, we would fix our country and guarantee prosperity for generations to come. Visit Duke’s website for more information. America In Crisis – How Can We Save America? No sane person has the goal of getting their kids or Grand-kids hooked on Drugs but many people worry what they can do about it. Some feel they don’t know enough about the subject to talk to their little ones about drugs. Others feel that scaring them or threatening them will do the Trick. Some even think their kids will work it out for themselves and don’t even broach the subject. All told it is a very real problem that faces our Children. Steve Cook is taking on a huge challenge to help every parent on the Planet keep their kids away for drugs. Walk The Kingdom is a campaign that will take him around 9 months to complete and will require him to walk up to 20 miles a day to achieve the overall target of over 4000 Miles to cover the entire coastline of the UK mainland. Steve, who is in his SIXTIES, wants to raise money and awareness so that no child misses out on what he feels is Vital information to keep our kids drug free. The information he’s talking about is put across to kids from a very unlikely source. Steve is over 850 miles into his walk as this show airs. Each week on this show we will be hearing from Steve out on the coastline road, and Pete who will be giving key information you need to keep your kids drug free. One Gritty Grandad has had enough of worrying about his kids and grandkids getting involved in Drugs. He’s sick to the back teeth of being told nothing can be done about it, that its all down to luck whether his kids will fall prey to peer pressure or even worse believe what the pushers are saying! 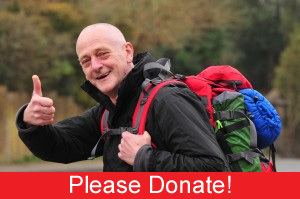 Steve Cook , a 63 yr old Grandad from the UK has taken to the Road and set out on a nine month quest to tell the rest of the world That you can do something about it! 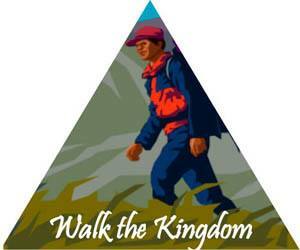 His campaign “Walk The Kingdom” Will have him walk over 4,000 miles around the entire coastline of the UK. Why ? You may well ask! Because Steve believes, along with thousands of teachers and children who have already received the information, that by arming our kids with the Truth and Facts about drugs, we can empower them so they can make educated decisions with regards to drugs and be able to lead drug free lives! How does the body deal with a poison? How does the body become addicted? How does the central nervous system work? How do drugs effect the mind? How to get a high out of life without putting a drug in your body! Once they have these it gives them the underpinning truths to make good choices”. TLB: Pete and Steve are the best of friends with the best of intentions and offering the best they possibly can … and the world is a better place because of them … !!! Steve and Pete have a goal that no child misses this information not just in the UK ,where they hope to reach over 1 million kids with Steves campaign, but across the globe as well. Please visit Steve at his website Walk The Kingdom for daily updates and videos. Donate to this worthwhile cause or help in any way you feel comfortable with, even if just helping to get the word out. Steve is over 750 miles into his walk as this show airs. When we look at the Drug problem from a parents view point it can be a very overwhelming affair. All the influences that our children face it can be so worrying to think what false information your child can come come into contact with and be swayed by. As with any problem if you break it down into its parts it can be solved. One man, Steve Cook a Grandad, is well on the way to getting the message out that something can be done about it. He started walking on the 1st of May 2015 around the entire coastline of the UK,over 4000 miles to raise awareness of what he believes no child should miss out on. The true facts about drugs! Theses Drug Education talks break the problem down in to very small simple pieces so a child can understand for themselves, what is a drug, how the body deals with a poison and becomes addicted and how setting goals putting effort and reaching those goals can give them a natural high without putting a poison in their body. Drug Free Kids is a campaign led by former British Thai Boxing Champion to reach as he says “the kids before the Dealers Do “. Pete, who almost died in his early 20s through Drug and Alcohol abuse ,Has been delivering talks all over the UK,Ireland , Belgium and as far away as New Zealand to now just over 80,00 young people. Pete says ” Our young people are so intelligent that if you give them this True data they can see straight away through the lies and false information promoted by various quarters with vested interest”. He is serious. He’s well past 750 miles, covering on average 20 miles a day, and is more and more determined every single day to complete this task. Whats driving him on is not only the purpose of what he’s trying to achieve “Drug Free Kids” but the overwhelming support from the man in the street who agrees we need to do something and ensure our children’s futures. Follow him, donate and help change the future for all our Children. 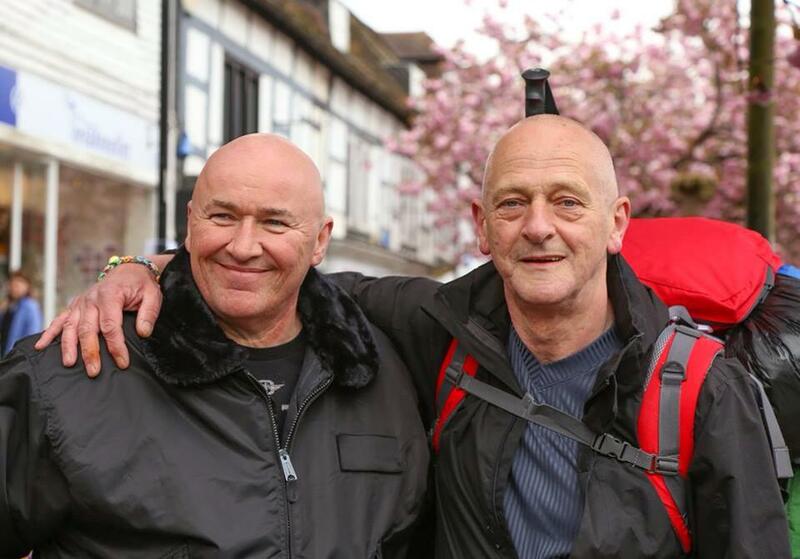 Steve is over 650 miles into his walk as this show airs. Bringing children up in today’s society any parent has a least a few concerns for their child. Will they be successful , will they get married, have kids, earn enough to do what they want in life and most of all will they be happy. Any one with kids growing up in today’s world does have a least one worry in common. How can I stop my child from getting in with the wrong crowd , what if someone try’s to get to my child and get them involved , how can I protect them , keep them safe and how can I discuss drugs with them so they will listen and steer clear of the whole drug problem. How young is too young? Well after delivering Drug Awareness talks for the last 10 years to over 79,000 kids I can honestly say with hand on heart there is a solution and I believe that ages from 9-11 yrs is the ideal age to discuss this as they are right at the age where they are making choices of what they think is cool and who they want to aspire to be like. Your child is bright, alert and totally able to make great decisions for themselves, as long as they have some True information to work from. If you think scaring them, saying whole heartedly “Just Say No” without giving them some true facts to work off to say why say no to drugs, I believe you are spinning the wheel and hoping that they won’t. The talks give young people an undercut to all the false information they might be fed through the multitude of channels they receive information on today. How the body deals with a poison. How the body becomes addicted to a drug. What Alcohol actually is and why we don’t think of it as a drug. How the central nervous system works in three stages with drugs. How setting goals and putting effort in can get you a natural high. How to see there is lots of info and it’s not all true. I have thousands of testimonials from children,teachers and parents saying this is what they need and want. Just go to www.mypinkbugatti.com,watch a couple of the modules and get your self the book to educate your child yourself or the DVD of the entire talk and sit and watch it with your kids. Don’t leave it to chance. There is a Grandad, Steve Cook, who feels that strongly about it that he’s walking over 4,000 miles around the entire coastline of the UK . He says he’s doing this because he doesn’t fell it’s fair that any child misses out on this crucial information. He is serious. He’s well past 650 miles, covering on average 20 miles a day, and is more and more determined every single day to complete this task. Whats driving him on is not only the purpose of what he’s trying to achieve “Drug Free Kids” but the overwhelming support from the man in the street who agrees we need to do something and ensure our children’s futures. Steve is over 500 miles into his walk as this show airs. When we look at the huge social problems that face us on our planet we can sometimes feel overwhelmed. One can feel sometimes that a huge amount of people are almost asleep to the problems of the world and cant confront the amount of evil and vested interest in keeping man down. I don’t think its unfair to say that we are constantly fed false information for profit and the average Joe lives in a virtual bubble, believing everything that is fed down the tube that actually keeps us where we are. If you had for a moment, ever thought that maybe the “Story” you just heard, read or saw on a screen somewhere might be just a little concocted … I believe you were right in thinking so. Then if you further went on to question what is being drip fed us on a daily basis you may well of ended up thinking to yourself that the problems are that huge how could you possibly change things. Well I put forward to you that there are huge numbers of amazing people doing amazing things on this planet that are changing the future. I say that if you want to change the future and change a drugged, unaware society, it starts with our children. If we can educate our children to the true facts about drugs, they can remain aware, productive and creative long into adulthood, and our children can be assured bright futures. This can be done and is being done very successfully and needs to now spread on a large scale across the planet. Steve Cook is one such Man that is changing the future. This 64 year old Grandad has taken on one huge task to bring attention across the Globe of a solution that he believes can change our children’s future. Effective Drug Education. Steve set out 4 weeks ago walking, with just a rucksack and map to walk the entire coastline of the UK. He is serious. He’s well past the 500 mile milestone, covering on average 20 miles a day, and is more and more determined every single day to complete this task. Whats driving him on is not only the purpose of what he’s trying to achieve “Drug Free Kids” but the overwhelming support from the man in the street who agrees we need to do something and ensure our children’s futures. Steve is over 450 miles into his walk as this show airs. You’ve heard it before im sure ” Kids are our future” Our Children are born with such a huge urge to create and help others, its magical. Im sure youve been in a room at some time when someone comes into the room with either a baby or small child smiles and light up the whole room. We look on our children with hope. Hope that they will live long, productive and happy lives. We want the very best for our kids. We are not just talking about illegal drugs here of course . We have a culture that has been sold down the river on lies that the solution lies in a pill bottle or indeed at the bottom of a beer bottle. We are told that we deserve, after the toil of the week, to go out and let our hair down and party some. I’m all up for having fun, but when the way to do it causes so many social problems, we need to have a serious look at what we are actually doing. When we really look at the multi-billion dollar industry that is the pharmaceutical industry, is it not the case that we cant see what’s right in front of our eyes because the lies are so huge. Just like your trying to advise a girl in an abusive relationship that her man is no good for her, as she sits with two black eyes, and she just cant see it. If we want to change the future we have to empower our children with the truth and established facts about drugs so they can go on and create a better future than the one we have created. Children are so intelligent that if you present them with some truths they thrive on it. Looking the other way and hoping that someone else is going to do it, or that by some miracle it will all work out in the end, “surely there are people who’s job this is ?” Or indeed believing there is nothing we can do about it. Our Children’s futures are in our hands! It is reality that we can educate our kids about drugs, and we can have a future with drug free kids on mass, changing the tide on what I believe is such a huge problem, that we find it hard to confront. One man, a Grandad, has taken a stand and said enough is enough. Steve Cook who is in his sixties is currently walking around the entire coastline of the UK. He is walking over 4,000 miles to bring attention to what he believes is the solution to the problem. Effective Drug Education for our Children to empower them to remain Drug Free. Pete Dwan started drinking and taking drugs at 13 yrs of age. This spiraled out of control to the point where he almost died at the age of 22 after his Liver stopped working. After making a full recovery, through substituting the high of drugs and drink with the high of competing in physical combat sport, Pete became the British Thai Boxing Champion. Years later Pete was being quizzed about drugs from his own kids when he realized with his own experience he would be in a good position to talk to kids about drugs. So after training as Drug lecturer he started. Fast forward 10 years and Pete, now with his own Drug Education ” Urban Warrior” Radio show has spoken to over 78,000 kids all over the UK, Ireland, New Zealand and Belgium (Visit Pete’s website HERE). After hearing Pete’s talk Steve decided that no kids should miss out on this vital information and has set himself this humongous task to bring attention to Pete’s work. Steve is about 340 miles into his walk as this show airs. Each week on this show we will be hearing from Steve out on the coastline road and Pete who will be giving key information you need to keep your kids drug free. 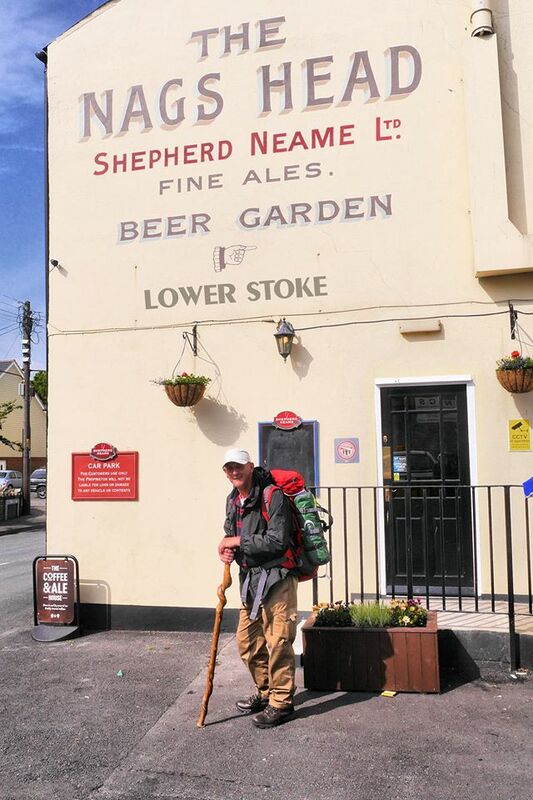 Steve outside the Nags Head, Lower Stoke, Near Rochester, Kent, 0n the May 15, 2015 where the Landlord put him up for the night. In the morning he told me that he was proceeding to Allhallows and then through the villages of Dickens Country to Gravesend where he will board the ferry across the Thames to Essex, and make his way up the East Coast. We wish him and his cause all the very best, well done so far Steve !!! AMERICANS – QUICK FIX JUNKIES! So you are on your way to work one morning and all of a sudden you see steam rising up from under the hood, well you pound on the steering wheel and voice a few unpleasant thoughts and pull into the local service station in search of assistance. A familiar face approaches and signals for you to pop the hood, after a few seconds he walks up to the window and tells you that a radiator hose has abraised itself against the engine and has a small hole in it. Because we are so used to instant gratification or quick solutions (fixes), you let him know that you need your car and cannot be late for work. He ponders for a second and then he tells you that he has some sealing tape that should provide a quick fix for the problem. The repair is made and he even sells you a roll of the sealing tape just in case, but also warns you that the only way to really get rid of the problem is to replace the faulty hose, and that he cant guarantee how long the quick fix will hold up. You pull away from the service station in just a few minutes thinking “Man that was a quick fix!” And all is great in Whoville. Flash forward several months and you have embarked on a 250 mile business trip that is vital to your future employment. As you are driving along out in the middle of nowhere, surrounded by a lot of nothing, you begin to notice steam again coming out from under the hood. So again you pound on the steering wheel and voice a few unpleasant words and pull over to the side of the road. Inspection shows that the hole in the hose is much bigger, the hose looks flaccid and cracked and the tape is torn and frayed. Realizing you had bought the additional tape, you proceed to seal the torn hose as best as you can and continue happily on your way thinking “Man that was quick”. Well about 100 miles further down the road (still in the middle of nowhere) all hell breaks loose! Steam billows out from under the hood, the temperature gauge slams deep into the red and the engine starts to buck and sputter, within seconds the engine gasps and dies. You are stuck, and your future employment prospect is trashed. What was a relatively small and inexpensive issue (replacing a hose) is now a major issue of lost employment, a seized engine, and a massive towing bill. The implications of what you are facing are daunting. Sitting by the side of the road with your thumb raised high waiting for another car to pass, your thoughts go back to the original problem and you realize, none of this would have happened if you would have just taken the advice of the mechanic and taken the time and minor cost to repair the problem and not opted (because of convenience or discomfort), for the quick fix … the quick fix mentality would not be wreaking havoc on your life. I know this sounds familiar to all of us and I could have used many examples we are all intimately familiar with (on a daily basis) to make this vital point. America is a nation of quick fixes whether it be for personal, infrastructure, budgetary concerns etc…, it is always about, what can we do right now to make the problem go away for a while, till somebody else has the watch, till I am re-elected, always kicking the proverbial can down the road in perpetuity applying one band-aid after another until the original problem/component is so damaged or overwhelming, it can no longer be repaired (think Social Security). Left to their own devices our elected leaders never wish to make the hard or unpopular decisions that may reflect bad on them, or damage their reelection prospects, and too many of us, in our ignorance or apathy, listen to their quick fix solutions and praise them for their ingenuity and service. And again, all is great in Whoville. Which leaves us in our present situation, this country is broke in so many ways it is impossible to mention them all in a commentary such as this. So what will be the next quick fix? 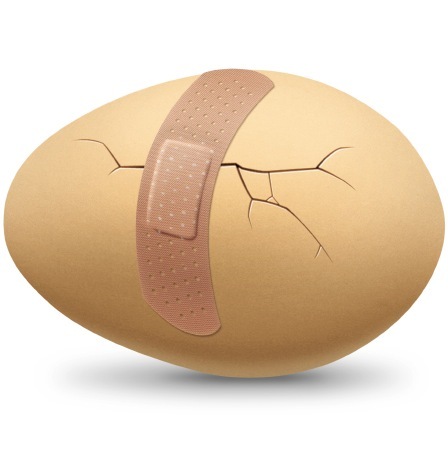 As we watch America failing today due to worn out or patched up components (economy, leadership, social programs, military imperialism etc…) subjected to the quick fix mentality, the question our leaders are now debating among themselves is … “IS” there another quick fix? Or is it time to pay the proverbial piper? WE MUST STOP WITH THE QUICK FIXES! All of this starts with We the people fixing ourselves. WE have allowed just about all we see and suffer by our blind trust and lack of participation. Do you honestly feel that our present government, if left to their own devices, would drastically change path … a path that has centralized more power and control of wealth into their hands than anyone could have conceived of mere generations ago? If you do believe this on any level, you are a fool of the first magnitude. DELETE, REPLACE OR UPGRADE THE FAULTY PART! If the Fed is broke, replace it with something that benefits We The People, NOT the global Oligarchs. If DHS is broke, erase it from existence. If the tax code is broke, upgrade it with a mechanism that efficiently funds America without breaking the backs of We The People. If the mission of our military is broke, change it for a better one that does not serve as the big stick of the global money changers etc… !!! We as a nation need to learn from these hard lessons to fix our problems and not saddle our future generations with our ineptitude’s. An oh so wise Native American adage states: “We do not inherit the world from our parents, we borrow it from our children” and the Quick Fix mentality that has prevailed in America for so long is destroying that legacy. Stop and think please … What will we have left to return to our children, and how will we be remembered? When you hit the play button on this outstanding and inspiring video please understand … This is not about the military or military power. This is not about politics or political power. This is not about wealth or the power of money. This is about humanity and the power of our hearts and souls … The absolute power to change the world for generations … for millions and maybe even billions. So please take less than twenty minutes from your busy day and listen to some hard earned and well used wisdom, wisdom that may just navigate you onto the path of making a serious difference in a chaotic world in serious need of changing. Do you want to change the world? Then listen to the University of Texas graduation ceremony remarks made by Naval Admiral William H. McRaven, BJ ’77, ninth commander of U.S.Special Operations Command.